Our Heart Healthy series continues and takes a look at the Mediterranean Diet food list. The Mediterranean diet is a heart-healthy way to eat as it is based on foods low in saturated fat and sugar and is modeled after how people eat in the countries bordering the Mediterranean Sea where heart disease rates are lowest. The Mediterranean diet features mostly fresh foods that include olive oil, fruits and vegetables, protein-rich legumes, fish and whole grains with moderate amounts of red wine and red meat. Some of the noted healthy benefits of the Mediterranean diet include reduced likelihood of developing high blood pressure, high cholesterol or becoming obese. You will notice that the foods that top the Mediterranean Diet food list are all heart healthy. If you are looking for new heart healthy recipes, make sure they include foods from this Mediterranean diet food list. Fish and poultry recommended 2 times a week as they are the start players for protein in the Mediterranean diet over red meat which is limited to only 12-16oz per month. 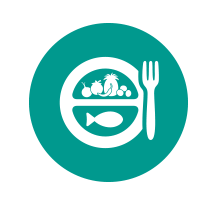 Seafood is a staple protein in the Mediterranean diet due to their proximity to the sea and many varieties of shellfish are enjoyed in Mediterranean diet recipes. Fattier fish like tuna supply heart-healthy omega-3 fatty acids, while lean shellfish like shrimp, squid and sea bass provide protein, niacin and selenium. Olive oil is the gold medal of healthy fats in the Mediterranean diet and it is used in place of butter, margarine and other oils in their heart healthy recipes. It is rich in monounsaturated fatty acids which lowers harmful cholesterol levels and its antioxidants and poly-phenols may explain the regions low heart disease rates. Fruits and vegetables are a large part of the Mediterranean diet food list and most Mediterranean diet recipes include the regions favorites of eggplant, tomatoes and peppers for their heart healthy fibre, folate, lycopene, vitamin, antioxidant and cancer fighting properties. Also included is artichokes, celery, broccoli, onions, peas, sweet potatoes, lettuce, mushrooms, and celery. Dessert is often fruits such as apples, cherries, dates, peaches, grapefruit, melons and strawberries. The Mediterranean diet suggests 7 to 10 servings of fresh fruits and vegetables should be consumed daily. Unrefined whole grains such as wheat, oats, couscous, rice, barley, and bulgur are popular in Mediterranean diet recipes and when combined with beans such as chick peas, provide high quality protein as well as fibre, B vitamins, folate, calcium, iron and zinc. Whole grains and beans help manage diabetes, prevent colon cancers and reduce heart disease risk. Known for their love of red wine, a glass a day is permitted on the Mediterranean diet as it contains antioxidants and resveratrol that helps prevent damage to blood vessels, reduces bad cholesterol may prevent heart disease. Not on the Mediterranean diet food list is soft drinks and high sugar fruit juices. Nuts are another staple of the Mediterranean diet food list as they contain unsaturated fatty acids, beneficial omega-3 fatty acids and protein. Tree nuts, such as walnuts and pecans and also hazelnuts are favorites but they are high in calories so only an ounce or two a day of unsalted nuts is recommended.